This variety of marijuana, Auto AK 47, is the perfect combination of both strains of famous genetics of AK47 and Lowryder, which together gave birth to extremely strong therapeutic variety with excellent growth characteristics and beautiful appearance, designed to please both recreational users and patients receiving medical cannabis.Developed by Neuro Seeds neuroscientists and geneticists, this variety can be grown absolutely everywhere. Auto-flowering characteristics of the plant stimulate the process of flowering in response to age that does not require following light cycle. 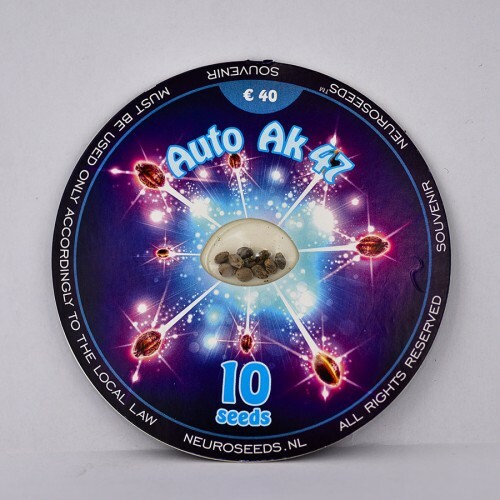 Auto Ak 47 needs only 56-70 days from seed to harvest to give about 100 g per plant.The flavor intensity is quite high - on the one hand it is sharp, and on the other it is sweet aroma.The high content of THC (14.4%), as well as the content of CBD (0.1%), makes this variety wonderful therapeutic tool in the fight against illnesses such as depression, headaches, chronic pain, insomnia, stress, anxiety, migraine, PTSD, bipolar disorder, attention deficit hyperactivity disorder.Immerse yourself in a state of creative thinking stimulation, euphoria, happiness, and relaxation.